Turns out a giant bus in China designed to straddle traffic, allowing cars to pass underneath, was not only a bafflingly stupid idea – the whole project was a US$19 million scam. 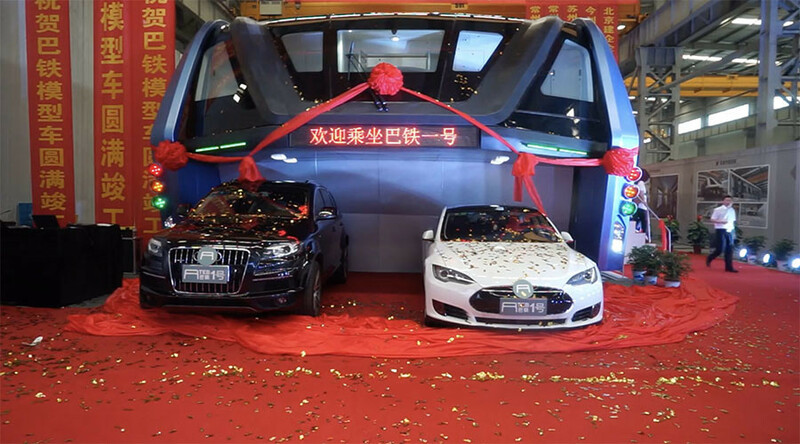 The Transit Elevated Bus, essentially a metro system that arches above cars, became an internet sensation when it was unveiled last year at a tech expo in Beijing. The so-called ‘car straddling bus’ would carry 300 passengers and was hailed as the future of transportation. It wasn’t long before the futuristic vehicle began to run into problems, however, with transportation experts questioning the safety and viability of the project, which also suffered financial issues. It was subsequently scrapped, and work began to demolish the $300 million test site at the end of June. It now transpires that the whole project was seemingly a scam. On Sunday, Beijing police announced it launched an investigation into the company responsible for the project – TEB Technology Development – for alleged illegal fundraising. It’s reported that 32 people have been detained by police, including Bai Zhiming, chief executive of TEB. Bai allegedly raised funds illegally through online financing platform Huaying Kailai, which he founded. At least 72 investors have reportedly filed lawsuits against the firm, which raised 130 million Yuan ($19m) by the end of 2016, promising investors a 12 per cent annual return on their investments. Police are now trying to recoup money from the company.